I am a kitchen gadget addict and like things in my kitchen that makes my life easier. When my sister asked me what I wanted for a present I told her that Ceramic Baking Beans would be a good idea. I have been asked by Yuppiechef to do a product review and I can tell you that I use my baking beans often. In fact, I would not mind having a second lot of them as they make such a difference. I know you can use any old beans, and keep and re-use them but these ceramic beans are much easier and user friendly than ordinary beans. The round balls fit snugly and perfectly into my flans and I have even made use of them when making tartlets in my muffin tin. 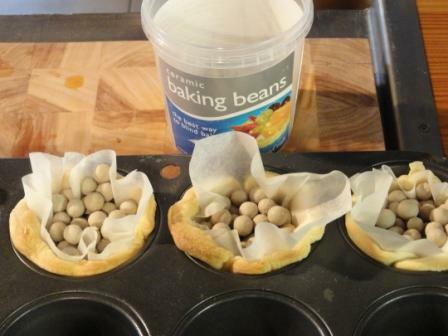 all you need is baking paper to get them out of the pastry shell with ease. Disclosure: I have not received payment in any form for this review. This post is in line with my blogging policy. When is the next cookathon, do you know?